The British summer. Every year we’re filled with hope; this year, this very one, will be the hottest on record. While we are invariably rewarded for our conviction with a smattering of scorching days (but only after having been promised and subsequently robbed of 3 heatwaves by mid-July), it is, for the most part, pretty miserable. There are, however, a few things that can be done to remedy the summer blues. I’ve put together some suggestions to help forget any weather-induced house arrest and allow for a little bit of fun if you can’t play in the sun, whether you’re planning a birthday bash or simply having a sofa day. Coffee is most likely a fundamental part of life if you’re over 18 and/or get up before 8am on a weekday, but we forget what a versatile social essential it really is. We catch-up over it, round off dinner with a fancy cup of it, it’s the dawn of a new and (possibly) productive day. Naturally, it will be involved at some point in a summertime shindig, be it a post-barbeque breather as you undo a jeans button or your morning saviour when that last gin is a very real regret. 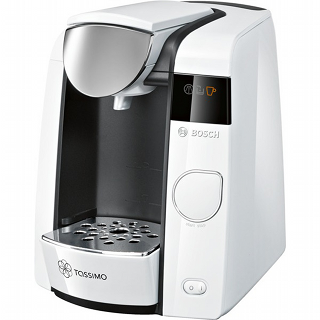 The Bosch Tassimo TAS4504GB Coffee Maker promises to please and, unlike our less-than-satisfactory weather, actually delivers. An array of over 40 drinks from noted brands and faultless beverage quality every time (thanks to Bosch’s astute INTELLIBREW™ technology) will leave even the most onerous of relatives quietly impressed post-dinner. As for curing a hangover, nothing can do that but time and a fried breakfast – however, the built-in BRITA MAXTRA water filtration technology will help to begin flushing out toxins and show you the delicately roasted, full-flavoured path to recovery. When the temperature finally manages to crawl over the 25°C mark – and inevitably it does, if only for a day or 3 - it’s met with exultation across the country. However, if you have to work, sleep or at all move more than to the fridge and back in a bout of tropicalesque weather, it becomes an endurance test. We quickly plummet back to British neutrality, vaguely complaining (it’s so hot, I think I’ve burnt, the tarmac’s melting) and generally not enjoying ourselves as much as we thought we would. Dyson can’t change that your car will become an oven on wheels but they can deliver an endless supply of fresh, cool air. The AM07 Tower Cool Fan is a slice of summer luxury. Bladeless (thus exceptionally safe) in design and endowed with a selection of 10 different power settings, it’s built for family spaces. That may not be particularly impressive on its own - we have learnt to expect great things from Dyson – but they don’t disappoint. 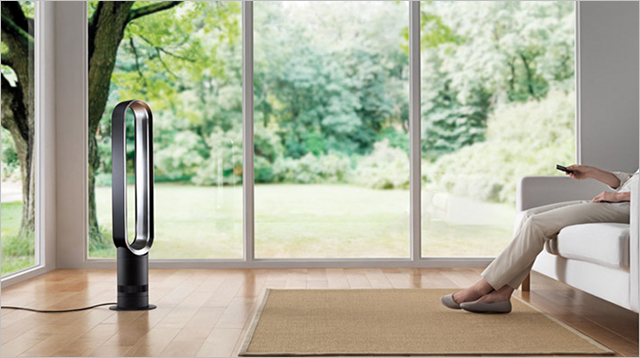 It incorporates their exclusive Air Multiplier technology, built to create an unfaltering stream of temperate air at the rate of your choosing with 60% less noise than a traditional fan. Perfectly unobtrusive for work and sure to give you a silent night (or peaceful sofa siesta), it will be your hot-spell hero. And just like that, we’re back to entertaining indoors. We’ve had nearly a whole week of uninterrupted sun, Monday to Friday has been glorious, so a barbeque is planned for the weekend. Our dreams have been actualized and this time, it’s for real! Subsequently, the weather retracts all previous statements and rains heavily on both our plans and fragile hope, forcing us and an excessive amount of pre-marinated food inside to be relegated to the oven. As is custom with a cookout, we’ve invited enough people to be mistaken for a small festival and are now presented with the challenge of feeding them all at the same time. 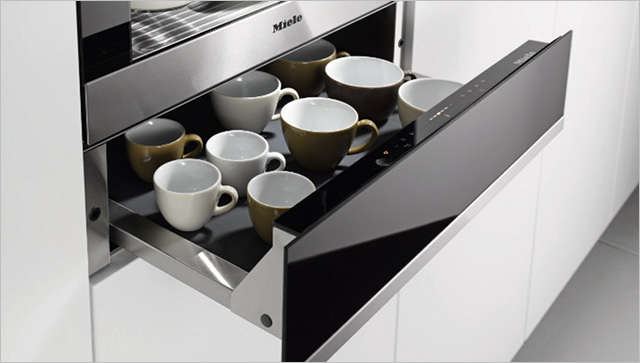 Miele, however, has an ingenious, incredibly innovative answer. The ContourLine ESW6214 Warming Drawer is a superbly versatile kitchen addition; as well as the obvious use of warming crockery, it can hold the perfect serving temperature of any dish so you can plate up for large parties without breaking a sweat. Telescopic runners and ultramodern touch controls make loading (you can fit enough tableware in for 12 guests with larger models) and programming a piece of cake, while foodies will revel in the surprising amount of culinary opportunities it creates. Gentle, accurate heat invites a little experimentation, making a vast array of cooking techniques - melting chocolate, proving yeast dough, defrosting (safely), slow cooking, even making yoghurt and dissolving gelatin – easy at home. All of this expert preparation rather detracts from the traditional barbeque food scale of burnt to toying-with-salmonella but, sometimes, we must make do. Food, a gentle (albeit engineered) breeze and tomorrow morning’s hangover help are ready to go - now to generate a little summer atmosphere, despite still having to occasionally throw on a cardigan. 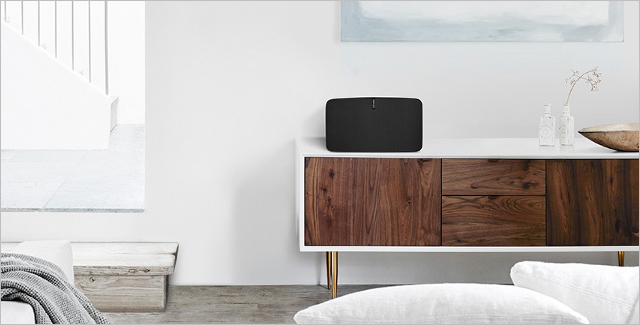 The Sonos PL5G2UK1 PLAY:5 Wireless Speaker will delight technophiles and music lovers alike, offering a commendable itinerary of connectivity possibilities and a huge array of supported music services. With stereo pairing at the ready (so you can turn 2 PLAY:5s into left and right speakers) and Trueplay tuning to maximise your sound wherever the PL5G2UK1’s placement, you can effortlessly build a hi-fi system to your specification. A total of 6 custom-designed drivers with dedicated amplifiers boost your music, delivering true audio exactly right for the room, while access to a lengthy list of on-demand, free and subscription-based music is guaranteed to keep the party going long after you started hinting for people to leave. However, with just a single app needed to control all streaming services, a few subtle track changes and an extended ‘accidental’ pause should achieve the desired result. Go ahead, splash out and treat yourself to a couple of great ways to distract from, or cope with, the mostly abysmal weather. Come rain or shine, this handful of select goodies will help you make it through the British summertime until we, once again, find ourselves pulling through colder weather with hopes for next year anew.